May 16-31, 1919, First air crossing of the Atlantic by Lt Comdr. A.C. Read USN in a Curtis flying boat NC-4. 3 Curtis flying boats set out from Trepassey Bay, Newfoundland and after many difficulties which included loss of a boat and a long water taxi only one remained by the Azores. 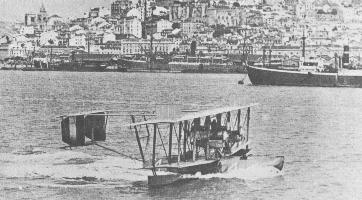 Lt Comdr Read transfered to the NC-4 and finally completed the crossing to Plymouth, England via Lisbon on 31 May.